Monday morning marked the first day of what's sure to be a busy summer and fall for Bryan Herta Autosport, Dan Wheldon, and INDYCAR officials as they test the 2012 car and engines. The Dallara prototype chassis and Honda engine made it's debut at the Mid-Ohio Motorsports Park piloted by 2-time Indianapolis 500 winner, Dan Wheldon. 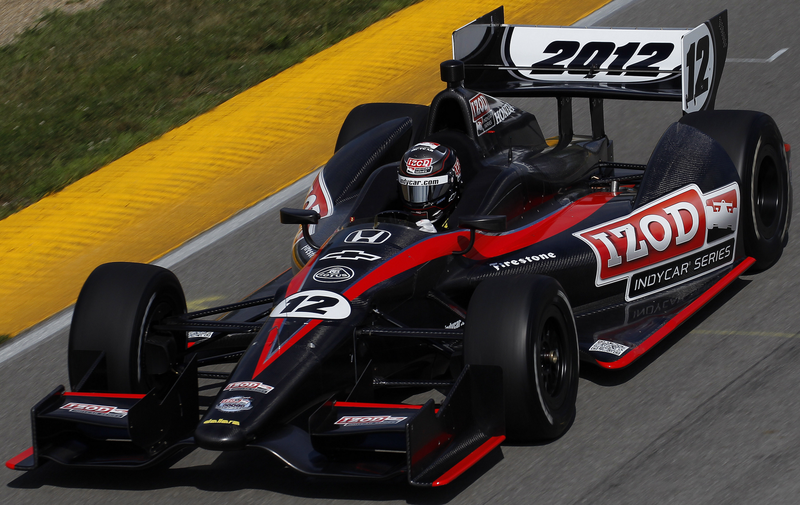 Hi-res photos posted below, courtesy of INDYCAR. The next test is scheduled at Texas Motor Speeday. Pretty sad when the winner of the Indy 500 can only get jobs as test driver and commentator on tv. Someone get this boy a sponsor! A couple of thoughts on the car tested here: first, the test car is a neat hybrid of the road course wings and superspeedway sidepods; I wonder if this would be the look for short, high-downforce ovals and sweepy natural-terrain courses. Second, the "airbox" looks like it's just a really elongated roll hoop that somehow channels air to the rear wing.